If you are annoyed by keeping CDs all the time, here is a perfect solution for you. You can simply convert your audio CD to ISO for preservation and easy conversion back. Imagine how nice it would be if you can have your audio CDs all the time with you while you actually don’t have to find a place to keep them intact. You can even put your audio CDs on the cloud so that you can always reach them without the need to dig them out from your garage. In this post, I would recommend several practical tools to help you create ISO from CD effortlessly and efficiently. Read on! CD represents mini laser tray, which is a general terminology for all CD media format. Nowadays, there are CD, CD-ROM, CD-ROM XA, picture CD, CD-I, video CD, etc on the market. Most people are familiar with Audio CD within multiple CD formats, which is a standard CD format used to save audio signal pathway like music or songs. CD is the abbreviation of compact disk. The first commercial CD player was developed on October 1st, 1982, which revealed the prelude of digital audio revolution. CD player remains the touchable link that connects the past to future. In the meantime, the expanded file is usually ISO for those disk mirror image file format that meets the standard for ISO 9660. There are a lot of advantages of ISO files, which will be presented at below. 1. ISO file can run directly at hard drive with the speed up to 200X. 2. ISO file can saved to MO disk, which means carrying MO disk could realize the coexistence of MO disk and optical disk. 3. ISO file is very easy for management. If you copy thousands of files to hard disk, it would be hard to perform because it cannot be done properly. And deletion would be a problem since most of optical disk software requires running at CD driver. Fortunately, this virtual CD driver solves those problems once and for all. 4. With professional compression methods and instant decoding algorithmic, ISO file’s compression ratio can up to 50%. And it will automatically decoding which makes playing without distortion. Therefore, ISO file is simply the CD/DVD disk folder and the only difference is that ISO does not wear a disc armament. You could even back up 3D Blu-ray ISO disc. It is like a virtual space for storing all the CD/DVD contents. Speaking of this, it is not hard to explain why there is so many people convert audio CD to ISO. To be honest, we need some efforts to make it happen and in order to provide a one-stop solution to you, I will show an example to create ISO from audio CD with the help of several tools in the following part. It is quite necessary to extract the audio from CD disc. The best way about it is to get help from third party software like 4Musics CD Ripper. Just simply drag & drop CD file to this app, then set the output information, which is super easy to operate. Then we can simply convert audio to video using Leawo Video Converter. Actually, all you need to do is a powerful app that could do the trick. Here recommend Leowo Video Converter. It can convert audio to video in a professional way. Note that this program belongs to the Leawo Prof. Media suite, using which you can easily convert the audio to DVD such as converting MP3 to DVD. You can simply drag your extracted audio here and start to convert the audio to any video format available on the program. Here we could use MP4 as an example. This converting process will be very fast to finish and you won’t need to worry about it. Needless to say, finally a professional and powerful tool is definitely demanded in terms of converting CD to ISO image. Leavo DVD Creator is one of the most competitive tools for you to create ISO from a CD since we have already successfully converted the audio to video using Leawo Video Converter. 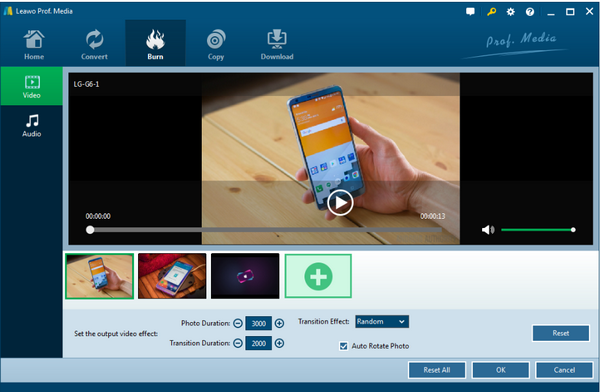 This tool is able to provide 6X faster speed to turn your 180+ formats of videos and photos to DVD with 40+ beautiful DVD menu templates. In addition, converting audio CD to ISO is also a key strength of this tool. Now let’s take a look at how we can extract CD to ISO using Leawo DVD Creator. 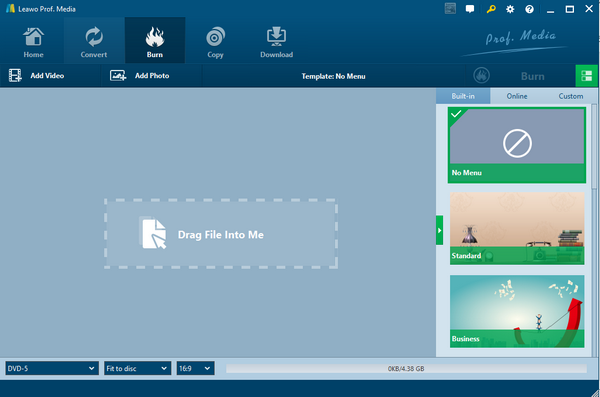 Step 1: Download Leowo DVD Creator. First download the app on your computer, then install it on your computer. Please double check before you download the Mac or Windows version to avoid compatibility. 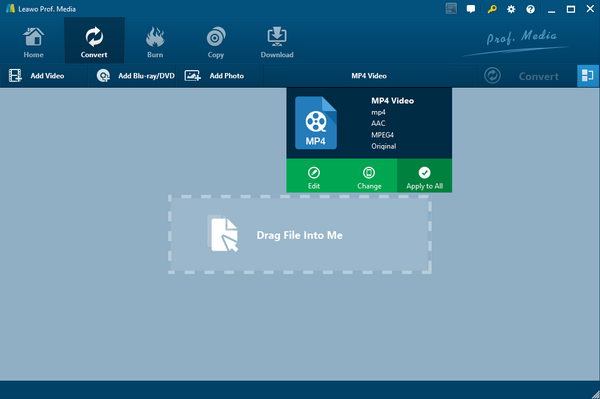 Step 2: Add the converted video to Leowo DVD Creator. Tap “Add Video” button on the top left corner of Leowo DVD Creator. Then choose the needed video. Step 4: Set or DIY disc menu (free). With 40+ stunning DVD menu templates, you can take advantage of menu templates to build more glorious DVD. You can choose preset templates or DIY templates by yourself. Just do as you wish. What’s more, after option, you can preview them instantly. Just click “No Menu” if you don’t need to set this up. Step 5: Custom DVD settings. After the menu is set, locate “Burn”. 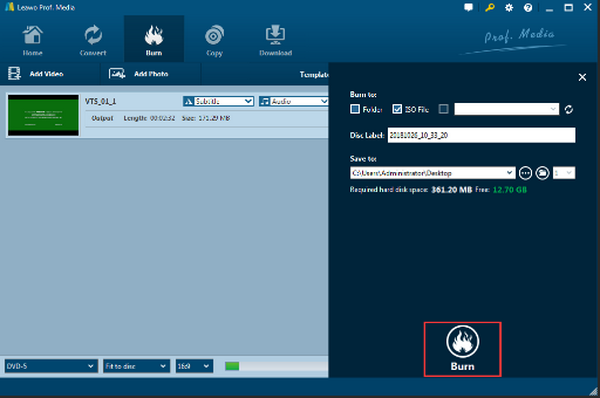 Under “Burn to” region, select ISO File, then set up Disc label and pathway to preserve the converted file. Step 6: Convert imported video to ISO file. Locate “Burn” button on the prompted interface and start burning. It should be finished soon. Once it is done, you will have an ISO file ready for playback or burned to DVD in the future. It becomes much easier for you to keep your CD audio materials from now on. This app supports to import audio directly and then burn it to ISO. It can help you to convert video between 500+ formats for free. How fascinate. Format Factory is a software that supports to import CD directly and then burn it to ISO. With intuitive interface, this program makes the conversion process easy to customer of all experience levels. We can see that between Leawo DVD Creator and the above two freeware, Leawo DVD Creator is far more competitive in terms of performance and reliability. Let’s draw a table to compare their cons and pros. Now you see, to convert your CD audio to ISO, you can take advantage of Leawo Prof. Media suite, which includes Leawo Video Converter and Leawo DVD Creator for you to to convert your audio to video and burn the converted video to ISO effortlessly and reliably. It even does not require network access at all, which means that you can do this entirely on your own whenever and wherever you are. Of course, you deserve the chance to try the other two freeware for converting CD to ISO on the internet and in a free way. However, after the comparison between Leawo DVD Creator and other options, we think that Leawo DVD Creator is far more competitive than the test programs, even they are free. I have shared with you at the very beginning that converting CD audio to ISO has become trending during these days thanks to so many advantages. We can better preserve our CD audio without the need to worry about any physical damage to the CD or where to keep the CD. ISO files present more advantages than CDs and we should definitely consider to convert our CD to ISO for the good of CD preservation. In summary, if you need to convert audio CD to ISO, Leawo Video Converter and Leawo DVD Creator will be the best choice for you.